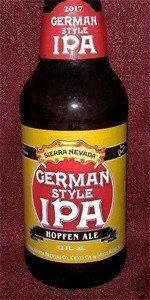 German Style IPA | Sierra Nevada Brewing Co. This Teutonic take on the traditional IPA features spicy German grown hops and an expressive Kolsch yeast. The result is a golden beer with a moderate bitterness and an intensely fruity aroma reminiscent of raspberry and lemon peel. Prost! Pour bright pale straw with gobs of lacing left down the glass. Nose is wonderfully German Pils, big soft bready biscuity nose, with some medium-low spicy and floral hops. Flavor is a perfect balance of biscuity bready malt, spicy hop flavor, moderate bitterness. Body is medium-full with medium-high carb. More IPL than IPA and really enjoy it. Very flavorful, yet refreshing and very balanced beer! I thought this was the best new beer in the 4 way ipa variety 12 pack. Pours pretty standard, golden/light copper colored beer, 3/4" white head. Aroma was of English like Euro hops. Is what it is. Taste is more of a mixture of English, German and West Coast ipas, and that is for the better. Usual descriptors of grapefruit, pine, dry toasted pale malts. Just more of a unique earthiness to it. Lacks the soggy woodiness and heavy earth feels of traditional English ipas. Respectable 50ibu levels of bitterness. Kolsch yeast feels neutral. Carbonation on point. Well done. Unique IPA with a Kolsch backbone of crackery malts, apple and hay. Modern-style German hops add mandarin, tangerine, lemon, berry, pepper and general spiciness. The aroma has the same notes. Crisp and dry with so.easy lager characteristics from the Kolsch yeast. Slight distracting aftertaste. Really good overall. From the 12 fl. oz. bottle. 2017 batch. Sampled on January 22, 2017. The pour is pale yellow in color leading up to a lasting white head and bubbly carbonation. The aroma tends to bring out resiny and earthy hop notes rather than something fruity or floral with an under current of white bread and Euro-malts. The body is between light and medium. There is a mild sweetness and bready character to the taste with a more herbal bitterness to finish. It lingers some. Poured from a bottle into a pint glass pours cloudy orange with a small white head. Smells of sweet grain and slight citrus. Tastes of sweet grain, slight wheat, and very slight citrus. Beer is light bodied and very drinkable, good carbonation. Overall, an above average beer. Appearance - Pours clear and golden yellow in color with a white, half finger width head. Fair retention, resulting in a very thin, broken layer of surface suds and a razor thin ring around the edge of the glass. Decent lacing, mostly consisting of broken lines and some spotting. Smell - Balanced aroma hitting on moderate notes of citrus, grass, floral and spice hops offset by big bready sweetness. Taste - Follows the nose. Very balanced flavor profile. Big bready malt body with hoppy notes of lemon and a touch of spice. Finishes much the same, with citrus zest and bready character lingering in the aftertaste. Overall - I think they accomplished what they set out to create, but the overall product itself isn't anything particularly noteworthy. It's very solid though. Something I'd drink while watching sports or doing work around the house, but not something I'd seek to buy. German Style IPA brewed by Sierra Nevada Brewing Co., with an ABV of 6.10% This English IPA pours out a hazy golden amber color with a small white head. Going to say this is an unfiltered brew, you can not see though this IPA. There is some spotty lacing to this brew, it sticks to the side of the glass well. However it is nothing really to write home about. The smell is rich with hop bitterness right off the bat. Then you pick up on some nice earthly grains and malts. There is also a slight sweetness to the smell of this IPA. Now for the taste, it is bold with hops. Then a nice smooth ending with earthly grains and malts. There is a slight touch of citrus flavors in the taste of this brew. German Style IPA , has a lot going on in it. There is a great look , good smell and taste. This is definitely one of the more Hopper IPA's on the market, not saying that is a bad thing. The body of German Style IPA is a solid medium, nothing to light, nothing to heavy. This English IPA has a real nice balance to it, there is nothing overpowering about this brew. It is really hard to pick up on the 6.10% ABV in this brew, it is just that smooth. The mouth feel is Bold, Hoppy, Rich, Clean and Refreshing. Overall I'm giving this brew a 4.25 out of 5. I would look this brew up again. Sierra Nevada Brewing Co., Did a real nice job with this brew. And the mixed 12 pack of goodness continues. A- Stubby 12oz bottle into a goblet with a slightly hazy medium golden body. The white, frothy cap ascends to about an inch high before falling at a moderate pace to a fluffy pillow and ring around the edges. Thin but plentiful webs of lace decorate the glass. S- Floral, herbal and spicy Euro hops off the top with a solid backing of grains and yeast. The malts are slightly sweet with hints of cereal, cracker, biscuit complimenting the very German yeast which reminds me of a Pils and is a bit winey. T- Much like the aroma with plenty of bitterness added in from the hops. Spicy, floral, herbal and earthy European hops are balanced out by a cracker, cereal, bread, pale fruit yeast hints, something vinous and a light sweetness. A hint of bitter lemon zest also comes into play. MF- Puffy and creamy body that comes with a bit of chewiness for a light-medium overall thickness. The carbonation is on the high side and certainly crisp. Finishes with a hearty hop bitterness. Not the beer of the century but it is certainly refreshing and importantly, interesting; which makes it a great addition to a mixed 12 pack. Heavy on the German yeast and the Euro hops. A: A lightly hazy golden amber in color. with a large white head. S: A laid back hop aroma, with a touch of peach and spice. There is a Lager like yeast aroma as well. T: Earthy hops, with notes of peach and apricot, finish is earthy with a touch of pine. Clean and refreshing. M: Medium light body, with fairly high carbonation. O: Overall, light, refreshing, and tatsy! 5/7/17...pours light cloudy gold with smattering of white foam. Malty chalky nose, very faint. Subtle. Citrus forward bitter, German pils taste with a heavier bitter. Lemon lingers. Simple and tasty IPA. Poured into a Sierra Nevada shaker pint. Pours a medium coppery amber with a fine one finger white head with good retention and lacing. Aroma of grainy biscuit malt, grassy hops and berries. Flavor follows, with lightly grainy biscuit malt, grassy hops with light lemon and raspberry. Finishes with nice solid whole grain bicuit and residual citrus and berry infused hops. Medium bodied with moderate creaminess. The grainy malt flavor is quite Kolsch inspired, but the hops and depth of malt are stronger. This provides the rustic flavor of a Kolsch but richer. The light fruit flavors are well integrated. A pleasant surprise, this was the one from the mixed pack I had the least expectations from and so far it's my favorite. Nicely done and hopefully will be a regular for Sierra Nevada. from 2017 4-way IPA 12 pack. 12 oz bottle poured into IPA glass. Smell: fruity (kiwi, maybe pineapple) with some spicy, herbal (light onion-like aroma) notes from the hops together with slight grainy cereal from the malt. Look: pale golden with almost 100% clarity and a good 1" head with unexpected low retention. some lacing is observed. Taste: mostly well balanced between the sweetness from the light malts, the hoppy fruity character and the prominent bitterness. Feel: medium bodied, with creamy, sticky texture, pronounced astringency and almost effervescent carbonation. Finishes dry but the significant bitterness lingers for a while in a way that is not fully pleasant. Like an overhopped Kolsch but experiment not totally successful. German Style IPA from Sierra Nevada Brewing Co.